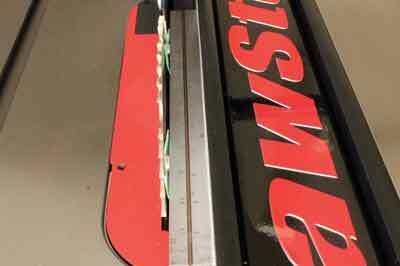 SawStop saws, the only saws with a blade-stopping feature, and now North America's No.1 selling cabinet saws, are celebrating their 10th anniversary, coinciding with the release of the sliding crosscut tables. I have used the industrial version of the SawStop saw before and six months ago, I finally purchased my own SawStop cabinet saw. In this article, I will share with you my experience of setting up the new saw and how I have tailored it specifically for my workshop. In 2009, the US Consumer Product Safety Commission found in a two-year stationary saw injury study that tablesaw injuries accounted for 78% of the 101,900 injuries recorded. However, neither this nor the alarming numbers found in the SawStop brochure - for instance, 10 tablesaw amputations every day - was why I ultimately chose SawStop. As a hobby woodworker adhering to safe shop practice, the 'finger-saving' feature was only a bonus factor in my consideration. The SawStop cabinet saw excels in two critical areas that my old contractor saw failed at badly: accuracy and dust collection. 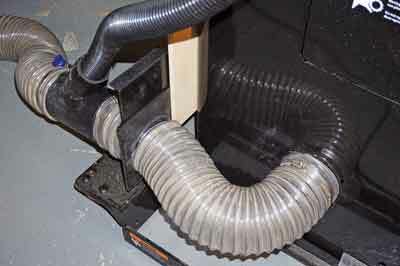 The SawStop's easy-to-use overarm dust collection is billed to have a 99% below-table dust collection capability. 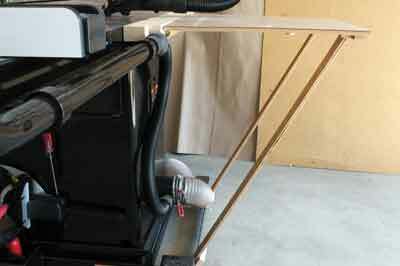 It is the most effective and user-friendly tablesaw dust system I have ever used. The saw's footprint is only marginally larger than my old machine and despite its heavy cast-iron construction and overall weight of about 250kg it is easily manoeuvrable, thanks to the hydraulic mobile base. Woodworkers around the world have seen SawStop's unique brake system through its famous 'hot dog' demos on YouTube - over four million views - or in person. The confident Steve Gass, the inventor of the technology, once even used his own fingers to demonstrate his blade-stopping system. In a nutshell, the blade carries an electrical signal, which is constantly monitored when the tablesaw is ready for use. A change to the signal, for example, due to skin contact, triggers the brake, stopping and dropping the blade below the tabletop. All that happens in less than five milliseconds. To put that in perspective a typical full airbag deployment in a motor car takes about 20 to 25 milliseconds and the blink of an eye about 200 milliseconds. But, how reliable is such flesh-sensing technology in stopping a blade typically spinning at 170km/h? The record speaks for itself: over the 10 years since the first saw was sold, no known failures have surfaced from any of its 40,000 owners. The SawStop arrived at my shop in boxes on a pallet. 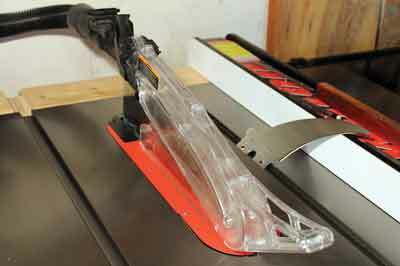 If quality is SawStop's niche, it starts with the user's manuals. They are written in English understandable by any average woodworker. Screws, bolts, etc. for the assembly were kept in separate packs and labelled, corresponding to the assembly instructions. Taking my time, I used about six hours to put the saw together. The only help I needed from my neighbour was to stand the main body upright and place it onto the mobile base. A new saw must be properly checked and tuned up for achieving straight and square cuts in three key aspects: 1) blade alignment, 2) mitre gauge alignment and 3) rip-fence alignment. To get accurate crosscuts or use jigs on the mitre slots - such as the tenoning jig - the mitre slots and the blade must be parallel to each other. I used a combination square for checking. Place the square's head against the inside edge of the slot and extend the ruler until it touches one of the blade's front teeth. Rotate the same tooth to the rear and slide the square down to check whether the tooth meets the ruler as it did at the front. If so, the slot and the saw blade are in alignment. 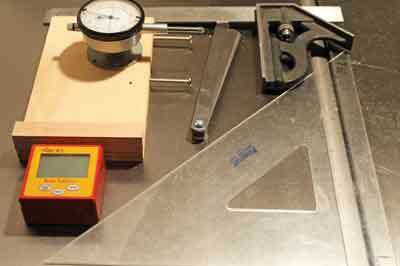 You can also use a feeler gauge to determine how far the alignment is off; I ignore any misalignment that is less than 0.06mm. If you want a higher level of accuracy with your saw, you can go with a dial indicator and even a calibration plate. 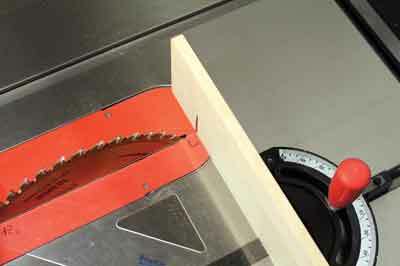 To set the mitre gauge for square cuts, you can align the head square to the blade using a drafting triangle. 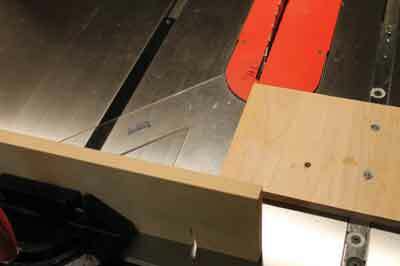 An American woodworker, Larry Schaller, came up with a more accurate method: he attached a board to a snug-fitting runner and trimmed off one side of the board. He then used the trimmed edge for setting the mitre gauge. Always check or set the fence square to the saw table before aligning the fence. 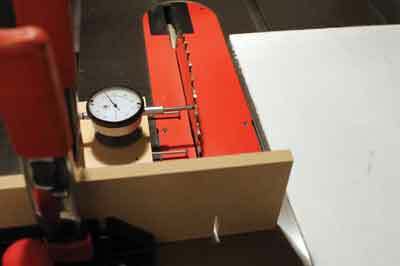 If you've used Schaller's method to align the mitre gauge, you can also use it to check the rip-fence alignment by flipping the jig around and bringing the fence up against it. Another way is to use the saw blade as the reference point: after attaching a straightedge to the body of the saw blade with two small rare earth magnets, slide the fence against the straight edge. If the fence is flush with the edge of the rule, the blade and fence are properly aligned. Excessive burn marks and crisscross saw marks are some of the symptoms of a mis-aligned fence. In North America, cross-cut sleds are built and used in a manner like the sliding tables. I have made a dust shroud for my cross-cut sled to take advantage of the overarm dust collection. Using scrap lumber, I also built a folding outfeed table which is more stable and easier to set up than a roller stand. In addition, the outfeed table legs rest on the mobile base of the saw rather than the floor, maintaining the same level with the table top at all times. Finally, my friend Rick Blaiklock, an executive in tool R&D, cleverly uses a blast gate to improve the overarm dust suction whenever needed. 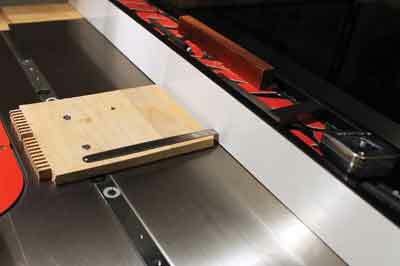 Many high school workshops and commercial woodshops in Canada have switched over to the SawStop technology in an effort to reduce shop accidents. 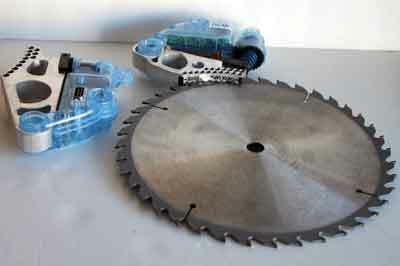 The SawStop feature is, however, seen by some, especially those in Europe who are accustomed to the crown guard feature on their saws, as unnecessary. Some also view the brake technology an incorrect focus on minimising the effects of an accident. They point out that the technology potentially may make some people become complacent about their workshop safety. Given the difference in shop culture, it is not surprising that the SawStop is far more popular in North America. I look at the blade-stopping technology the same way I feel about the airbags or anti-lock braking system in my car: it won't prevent accidents and I should not rely on it for my own safety. The additional protection is not an invitation for me to lower my guard or be careless. 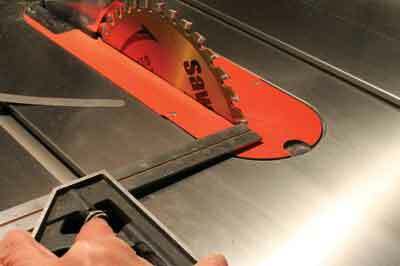 All SawStop owners also know that if the cartridge is triggered, they will lose some valuable shop time - unless they keep a spare cartridge - their prized saw blades and above all, a part of their egos. My workshop practice hasn't changed since the new saw was used, except one thing: I have found myself using the tablesaw more and doing more projects, because the machine produces dead-on accurate results every time and the sawing is practically dust-free. The machine is a joy to use in the real sense. That is how enjoyable woodworking should be!